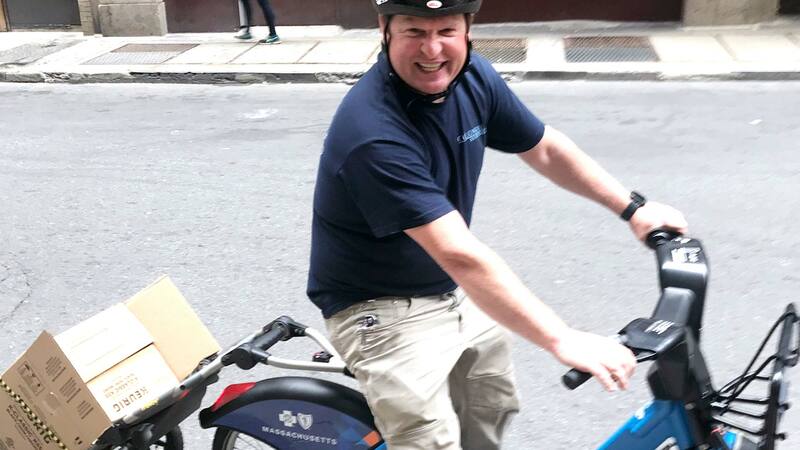 On workdays, Colonial Systems installation foreman Kevin O’Rourke is a big fan of the kind of bike sharing that’s become increasingly popular with city dwellers. 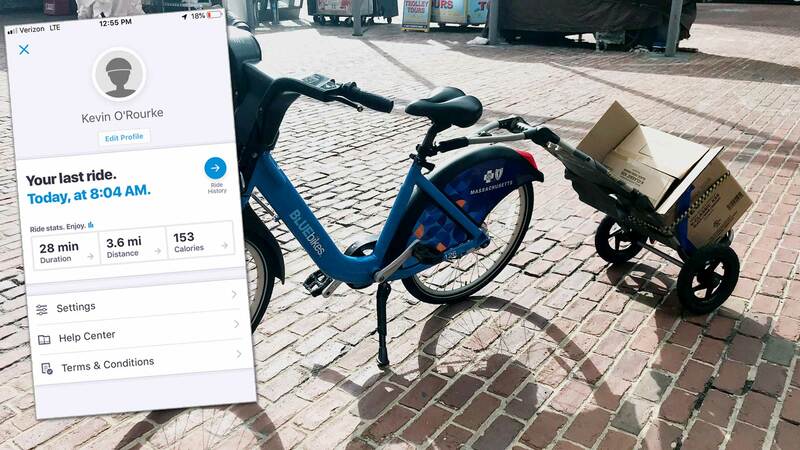 In metro Boston, that means the Bluebikes bicycle sharing system operated by Motivate International and owned by the municipalities of Boston, Cambridge, Somerville, and Brookline in partnership with Blue Cross Blue Shield of Massachusetts. The Bluebikes system is designed to be a fun, affordable and convenient transportation option for short hops and touring around town. More than 2,500 of the distinctive, easy-to-ride bicycles are stationed at over 260 strategically selected spots in the metro Boston area. Using a Single Trip ticket, an Adventure Pass, or an Annual Pass to unlock a Bluebike from its dock, you can take a quick one-way trip, a leisurely ride, a commute to school or work, run errands, or explore the city. When you’re done, return the Bluebike to any station in the system, slide it into a dock, and go on about your business. On many a workday, “going on about your business” for Kevin O’Rourke means going to the Colonial Systems job site where he is the assigned foreman providing supervision, project management, and technical direction for an office furniture installation project. Equipped with an Annual Pass ($99 per year), Kevin has been a Bluebikes rider for more than five years now. Lowering his commuting costs was Kevin’s initial reason for trying Bluebikes. That was before he was promoted to foreman and was still driving his personal vehicle into the city to work. The parking he found close in to job sites tended to be paid and often expensive parking. It occurred to him that, with the Bluebikes system, he could park his vehicle further from the job site where parking was less expensive or even free, and pick up a Bluebike to go the rest of the way to work. Now, as a foreman, Kevin has the use of a company van for his travel to job sites. But he still finds good reasons to incorporate the Bluebikes system into his workday. It’s pretty clear from talking with him that Bluebikes has become for Kevin what Uber or Lyft are for other people — a naturally convenient way to get from point A to point B, save time, and eliminate hassle. The little cargo trailer Kevin bought a few years back to haul tools and supplies behind his Bluebikes is a sign that bike sharing is well integrated into his daily routines. 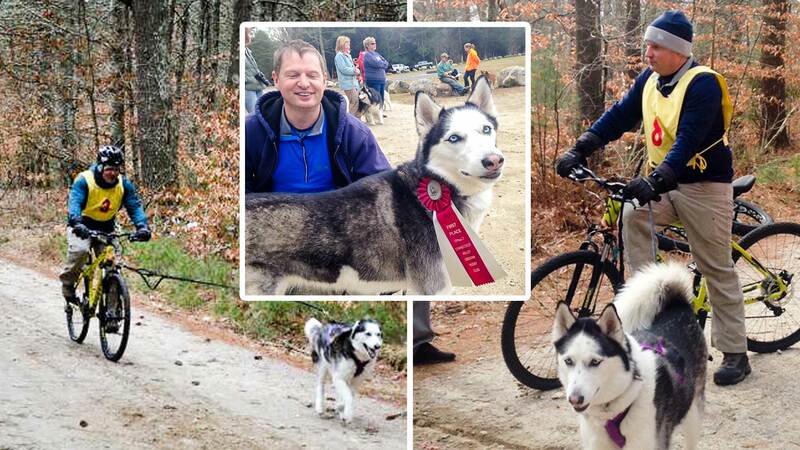 On weekends you can often find Kevin pedaling through beautiful New England countryside in the close company of Faith, the husky that Kevin got when she was a tad over a year and a half old. 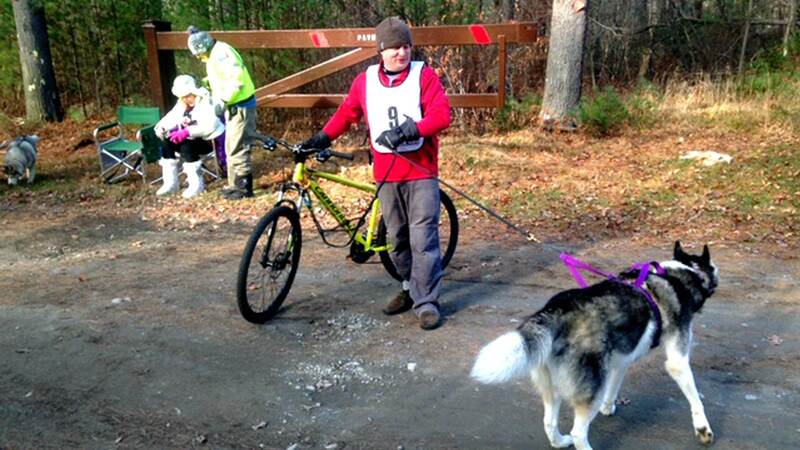 Faith, who’s now eight, is Kevin’s constant partner in bikejoring competitions. Kevin was already an avid bicyclist for some years when Faith came to live with the O’Rourkes. Like Kevin, Faith had no experience with bikejoring. That was soon to change for man and dog alike. Bluebikes figure into Kevin’s leisure activities, too. Kevin and his wife sometimes use the system to exercise and explore on two wheels. They’ve even entertained using Bluebikes. Kevin won’t take credit for being a good influence but he did say that he’s seen other contractors at Colonial job sites using Bluebikes. 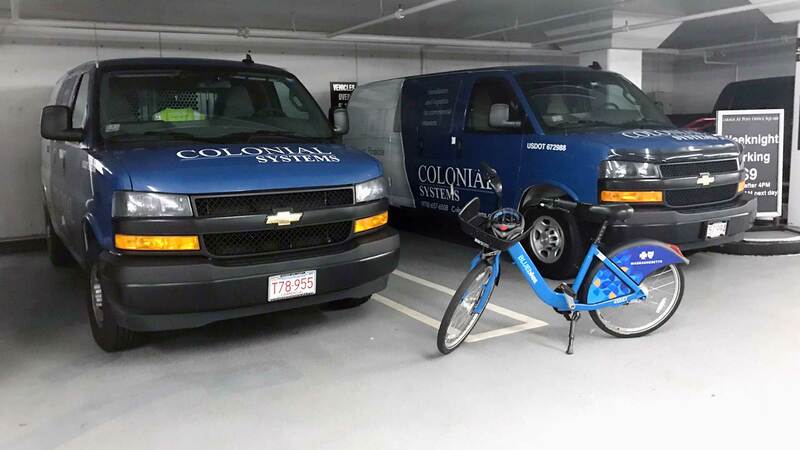 And there’s a small but growing number of Colonial installers who are using Bluebikes to get back and forth to the job site after finding free or inexpensive parking. 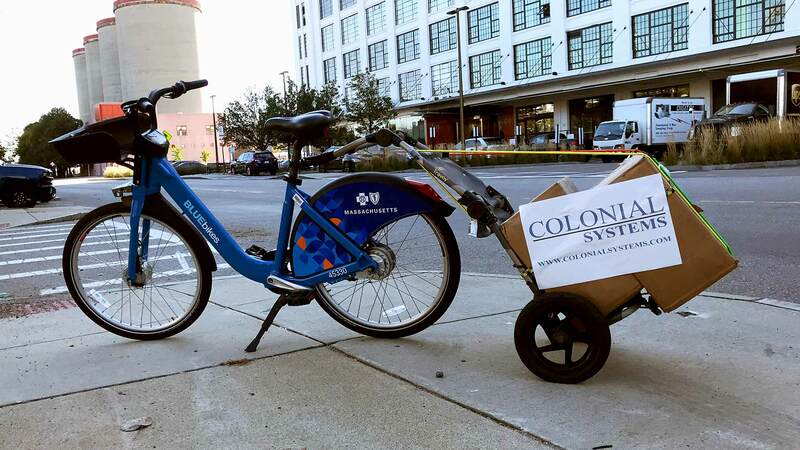 Credit goes to Billy Harrison, Wayne Rudolph, Aaron Stehlik, Dillon Womble, and any other members of the Colonial Systems field staff who, like Kevin O’Rourke, are putting the Bluebikes system to good use, respecting the environment, and pursuing a healthy lifestyle. Kevin O’Rourke’s use of the Bluebikes system is a good example of how smart solutions can benefit the individual (lower expenses, greater convenience, healthy exercise), the natural environment (cleaner air), and society (less urban traffic congestion) all at the same time. 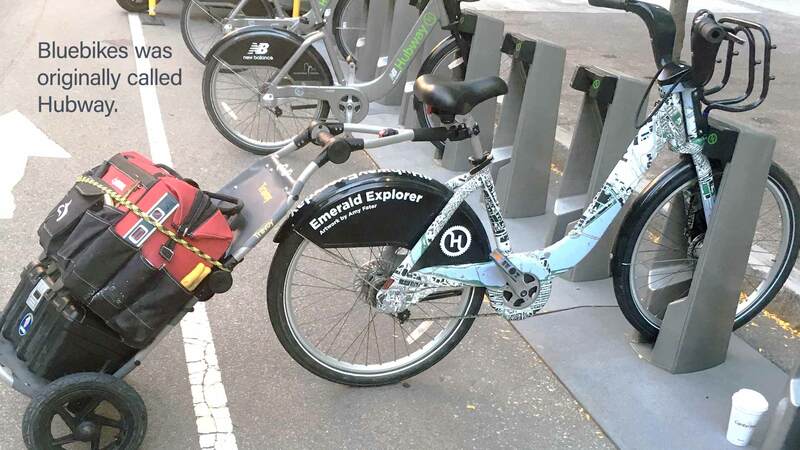 We applaud what Kevin and other members of our field staff are doing as Bluebike users. We recognize, too, that they reflect Colonial’s corporate commitment to reduce our carbon footprint, add as little as possible to the solid waste stream, and apply Colonial’s expertise to support our clients’ sustainability objectives. We had an opportunity recently to discuss our installers’ use of Bluebikes with Jeff Bellows, Vice President for Corporate Citizenship and Public Affairs at Blue Cross Blue Shield of Massachusetts (Blue Cross). Blue Cross is a Colonial Systems client and the lead sponsor of Bluebikes. In 2015, Blue Cross made a significant commitment to incorporating sustainable materials and chemical-free furniture into the design of their new LEED-certified corporate headquarters at 101 Huntington. Colonial Systems was privileged to be the installation partner for that project, installing all the furniture as well as the architectural wall systems. 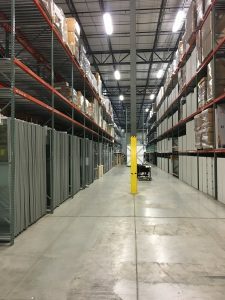 Excess wall product has been stored and managed at Colonial’s warehouse through our asset management system. Periodically, we are called on to pull specified units from the inventory for transport back to 101 Huntington, where we reinstall it to create reconfigured and even relocated workspace. Blue Cross is committed to helping Massachusetts residents lead healthy lives. In 2018, the company and the Blue Cross Blue Shield of Massachusetts Foundation contributed $12.1 million in financial grants and pro bono volunteer service to over 500 nonprofit organizations across the Commonwealth. The company believes that healthy people rely on a healthy planet and is focused on supporting solutions that improve air quality. Learn more about Blue Cross’s commitment to Healthy Living. Blue Cross announced its groundbreaking sponsorship of Bluebikes in early 2018. The six-year partnership features system upgrades, with brand new bikes, a new mobile app, and valet services at busy stations as well as increases in the number of bikes and communities served. Blue Cross has committed to add 1,200 new bikes and 100 new stations throughout Boston, Cambridge, Somerville, and Brookline by 2020. More than 6.5 million bike share rides have been taken since Boston launched the public bike share system in 2011, and it has become an integral part of the regional transportation network, providing first- and last-mile solutions and offsetting more than 8.3 million tons of carbon. Learn more at the Bluebikes website.